Look for anomalies in AFE actuals vs. budget by gaining a real-time view of your spending to date. The graph is plotted against the AFE budget, so larger budget AFEs with larger variances are highlighted. See what’s on your ‘to do’ list and get insight into where AFEs may be experiencing delays. View a recent search history to quickly access the AFEs you’re personally working on. See how your total AFE fiscal budget is distributed among your spend categories. Identify how many AFEs have been created, approved or rejected over a specified period, and where potential bottlenecks may exist in your approval chain. Compare year over year budgets, actuals and field estimates. 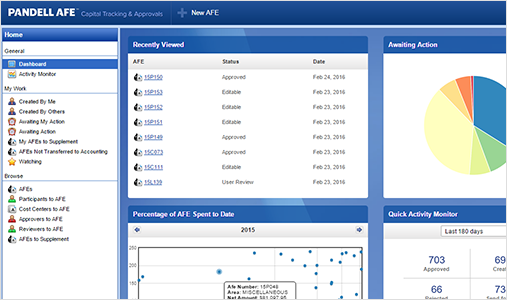 See the status of AFE spending against your operating budget. This helps you identify those AFEs that require a supplement, or are approaching a level where a supplement will be necessary. Identify the budgets, actuals, and field estimates within a specific area.